This is a Kegco DT1F-630SS Polished Stainless Steel Single Column, Single Faucet, 3" Diameter Draft Tower. This tower comes complete with one Perlick 630SS stainless faucets and one separate 5' lengths of 3/16" clear beer tubing with nozzle and hex nut assemblies. It will connect to all standard keg couplers. This tower is mounted using the gasket and four screws that are included. Faucet knobs are included. The Perlick stainless steel beer faucet is the most sanitary faucet available anywhere. Its innovative seat-forward design keeps internal parts from being exposed to air, preventing the handle lever from sticking and minimizing bacterial build-up. This revolutionary design and stainless steel body ensures a brewery fresh taste. In combination with the stainless steel tower shanks, your beer will only touch stainless steel metal components with this tower. Comments: The tower itself is very high quality. Perlick is always worth the modest extra money. However, the liquid hose came with a connector that would suited to a shank instead of a keg disconnect. I had to cut the connector off and replace. Comments: Ive been drinking beer from my kegerator for more than 5 years and over 40 kegs. This is by far the best investment I've made for my kegerator. Dont just think about going stainless do it. You wont regeret it. 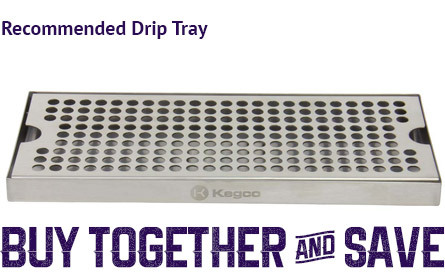 Add a Drip Tray Now and Save!